Grate the outermost peel of the lemon (yellow part of skin only) and set aside. Squeeze juice from lemon and set aside. In a large saucepan, combine the water, sugar, vanilla, star anise, lemon juice and grated peel; bring to a boil and simmer 5 minutes. Meanwhile, peel pears with vegetable peeler and cut a thin slice from the bottom of each pear, so they can stand upright. Leave the stems intact. Starting at the bottom, scoop out the entire core (including the seeds) of each pear using a melon baller. 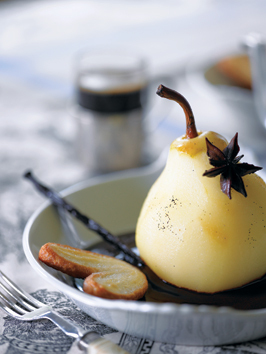 Place the pears into the simmering syrup and poach for 15 minutes, until they can be pierced with the tip of a knife. (Poaching time will vary depending on the ripeness of the pears). Let the pears cool in the syrup. Chocolate Sauce: Combine and heat the whipping cream, butter, chocolate and coffee in top of a double boiler over gently boiling water (upper pan should not touch water). Stir until completely smooth. If desired, add 1 tablespoon of your favorite liqueur (such as rum or cognac) for added flavor. Pour a pool of Chocolate Sauce onto each dessert plate and stand a pear in the middle, garnish with sprigs of mint and your favorite cookies. Pears may be poached earlier in the day. Prepare chocolate sauce 2 to 3 hours before plating dessert.